The Beas Tragedy – How Many Lives Is One Megawatt Worth? The death of twenty four students owing to a sudden surge in the Beas at Thalout by the release of waters from the Larji Dam yesterday is another instance of how the hydel projects in Himachal just don’t give a damn about safety-whether it is of the environment or of human beings. 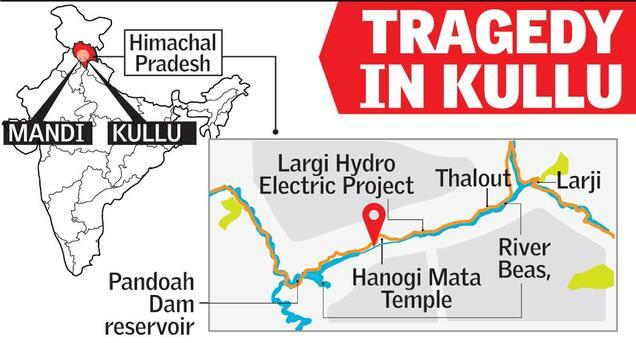 And this time the Himachal Pradesh government can’t just wash its hands off the whole matter because the Larji Project is its own, and is operated by the HP State Electricity Board (HPSEB). The Himachal Pradesh government has for years been warned of the heavy price that it is paying-and will continue to pay-for the reckless stupidity and cupidity with which it has been devastating its river and mountain systems. The environmental degradation in all its four major riverine valleys has been well documented and has reached a point of no return. Local villagers from Kinnaur to Bharmour have for years been protesting against the threats that these projects hold out to their lands and lives. NGOs, social activists and nature lovers of all shades have been petitioning the government and the courts to stop this wanton destruction. But the politicians and bureaucrats ensconced in Ellerslie can count only the megawatts and hear only the ringing of the cash registers. That was bad enough, but as the tragedy at Larji demonstrates, these hydel projects have also severely compromised human safety in order to cut costs and make even more money. It is an internationally mandated and accepted practice that all dams and reservoirs are required to install warning systems – advance proclamations, sirens, flashing lights-that have to be activated BEFORE releasing any unusual quantity of water. Shockingly, this is not insisted upon in Himachal. Similar accidents have happened in this state in the past also, in the Sutlej by the release of waters from the Nathpa-Jhakri project, in the Ravi valley and elsewhere, and lives have been lost before though not on the colossal scale as this time. But the Larji is a government project and the HP government and its HPSEB cannot hide from the question – why did it not issue an alarm before releasing the waters, and did it even have an advance warning system in place? I am given to understand that HPSEB had been repeatedly advised by environmental and safety experts to install these systems but it took a conscious decision NOT TO DO SO BECAUSE IT FELT THAT IT WAS AN UNNECESSARY COST! If this is true-and this aspect needs to be thoroughly investigated-it was an unpardonable, and a criminal, error of judgment and all those who were a party to it must be proceeded against. The ire of the local villagers after the incident, who blocked traffic to protest against the callousness of the project authorities, lends credence to the suspicion that no alarm system existed, or even if it did, it was never activated. They have complained of similar flash releases in the past. This just begs the question – how many megawatts is a human life worth, in the estimation of our project administrators? An immediate safety audit of ALL the hydel projects in the state must be carried out because with the monsoons approaching more such sudden releases from dams will become necessary. The Larji project is also responsible for another piece of engineering which is another disaster in waiting – the Larji Traffic Tunnel on the national highway between Mandi and Kullu. This 3.50 kilometer tunnel was constructed by the project as an alternative because the original stretch of the highway was submerged by the Larji reservoir. There are no checkposts at either ends of the tunnel and not a single telephone inside as an emergency instrument which could be used in case of an accident. If any accident happens inside the tunnel-car crash, tunnel collapse, landslide-those inside have no means of contacting anyone for help. (There is no cell phone connectivity within the tunnel). Once again, it needs to be reiterated that all global practices stipulate that such long tunnels should compulsorily have such communication systems, but Larji again appears to have cut corners. This also needs to be rectified immediately. The Himachal government, whose undertaking is the prime mover of this tragedy, cannot be entrusted with an inquiry into this incident. Furthermore, this is not an isolated incident and the larger issue of safety / warning systems in ALL hydel projects in the state needs to be investigated properly. It is therefore only proper that the government constitute a judicial commission to enquire into the matter and all its related aspects. The international commission on Dams should derecognize the the dams in HP and initiates an international inquiry on the authorities ASAP, if Modi not acts ruthlessly on this tragedy from repeating again. This is a seriius concern. Our govt.. thinks that by banning polythene, it became an environment loving state. Wt about our mmountains? From Rampur to Sangla.. Chamba to Bharmaour…. khokla kar diya hai pahado ko. The vegetation and environment which we Himacahliz are always take pride off is not going to survive more than 20 to 25 years. Have responded short while back?! It’s sad but I’ve noticed that Indians in general don’t care much about safety and don’t value life always thinking that it won’t be their life that will end because of lack of safety. I’ve witnessed this everywhere. Be it on roads, construction sites, or the ships I’ve worked on. No contractors have even heard of a safety harness and workers risk life and limb while working on tall structures. I heard that their was a hooter at the project but it broke down 6 months ago and was never replaced. Their was a warning sign on the road somewhere but it was only in Hindi and the paint had faded so badly that even Hindi speaking people couldn’t have read it. As you’ve mentioned the tunnel is truly a disaster waiting to happen. I was watching a discovery channel documentary about a long tunnel in Europe and they hired psychologists to study people’s driving habits and come up with solutions that stop people from falling asleep inside the tunnel. They tried to make it in a way that even claustrophobic people won’t feel panic inside it. In the Mandi Kullu tunnel there’s not even proper lighting and vehicles have to turn on their own lights. The dark tunnel is any claustrophobic’s nightmare. It all comes down to not caring enough about safety and human life. I don’t seem to understand this attitude of Indians. The Europeans on my ships wouldn’t work without proper safety equipment even if the owners of the ship got mad but the Indians would happily risk their and other’s lives just to please the owners and save them a few bucks. Maybe it’s got to do with the high population density. So many people die everyday that we have become blinded to it.